I know what everything is in my vegetable garden. But if I send someone else in there they would have no idea if there weren’t some plant markers! Especially things that look similar like cilantro, parsley, and carrot tops! I know my husband would come back with a fistful of carrot tops thinking he’d cut some parsley! So I decided I need to make a few more plant markers. 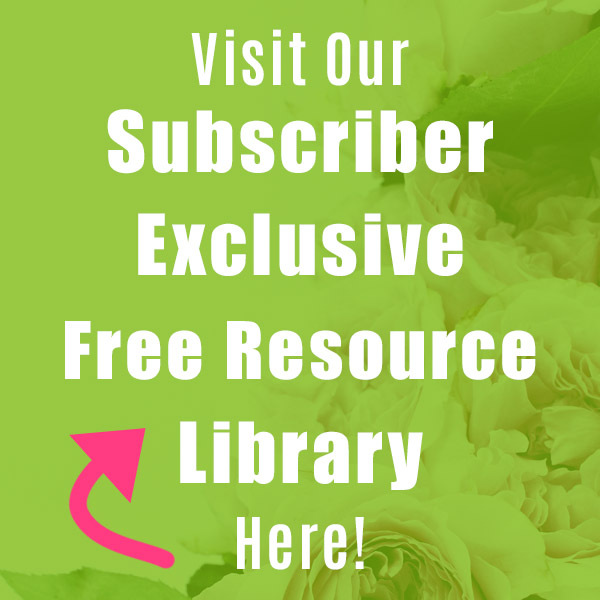 I’ve collected 11 Inexpensive and Creative DIY Plant Marker Ideas to share with you since I was looking for inspiration! 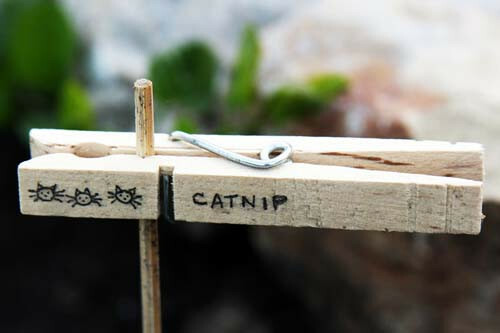 It can be easy to create cute and helpful plant markers, if you’re creative! Plus, all of these DIY ideas are really inexpensive, which is great if you have a lot of different plants. 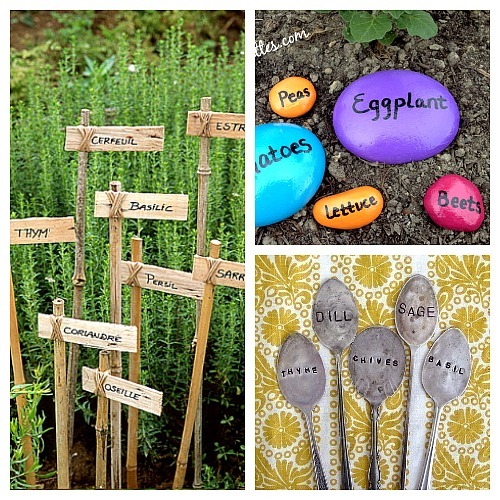 Take a look at the DIY garden marker ideas below and get inspired! 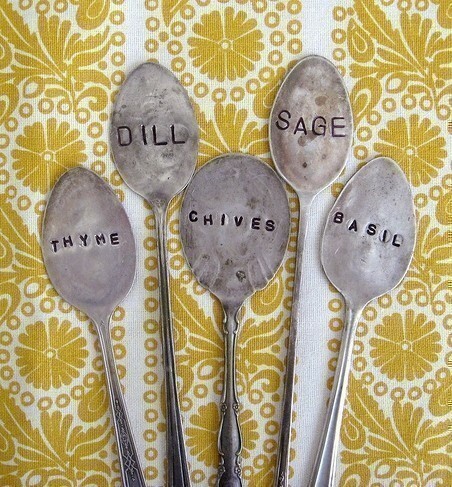 A few years ago I made stamped vintage silverware plant markers like these. They’re great because you make them once and they last forever! You can get an inexpensive metal letter stamp set on Amazon. The pretty stamped plant markers above are made by Shrimp Salad Circus. Visit her for the tutorial. 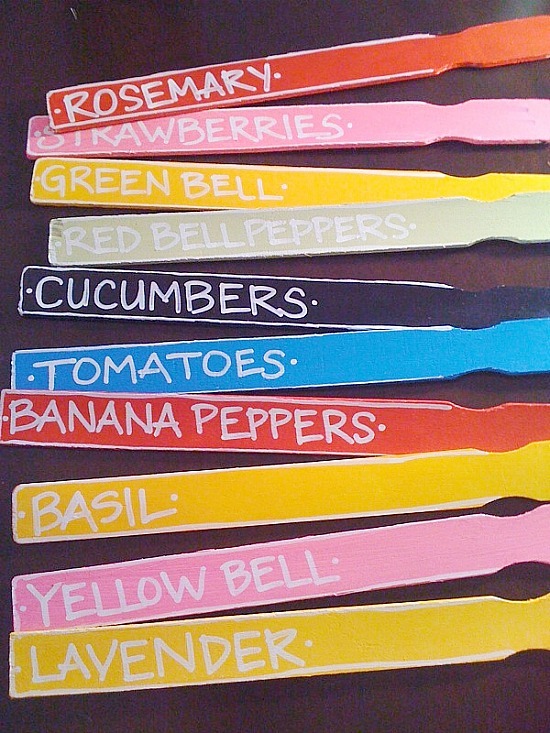 These clothespin plant markers would be very inexpensive to do. You could even get jumbo clothespins if you wanted them to be a bit bigger. Check out the tutorial on Glue and Glitter! (Edit: It looks like the original tutorial has been removed, but Glue and Glitter has a revised clothespin plant marker tutorial available)! 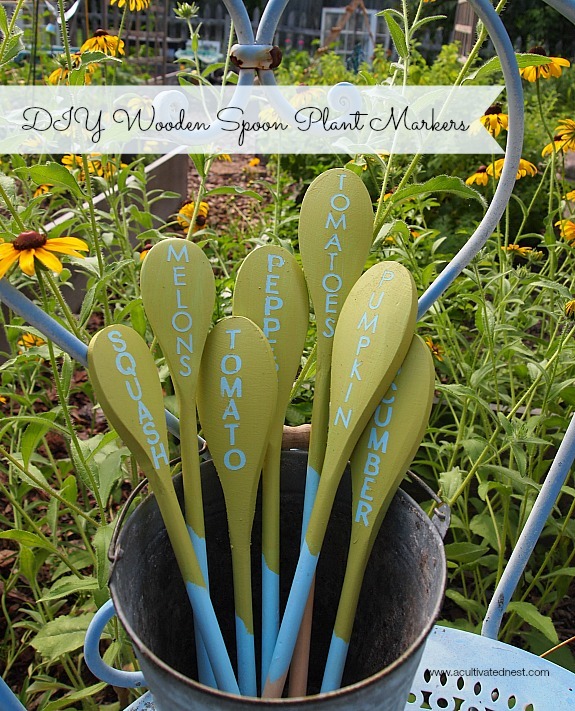 Aren’t these wooden spoon plant markers a neat idea? I found some similar looking un-stamped wooden spoons on Amazon. You could probably use the same stamping set for #1 to make these. 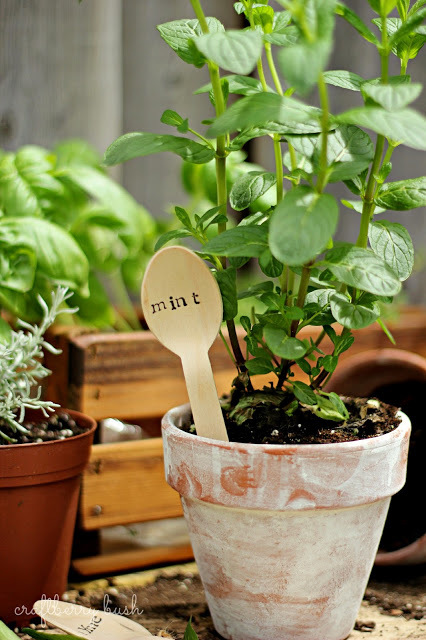 Visit Craftberry Bush to find out how to make your own cute wooden spoon garden markers! These garden stones are bright and colorful and will last a while. 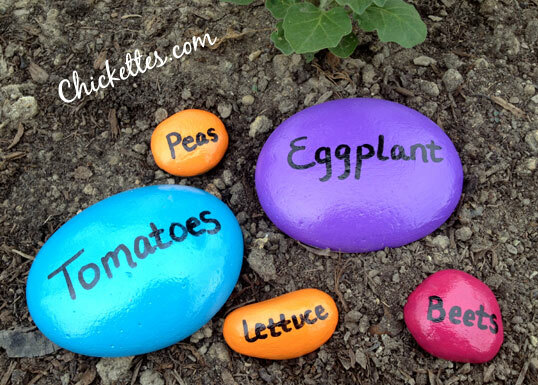 Chickettes explains how to make your own painted stone plant markers! I don’t have any wine corks, but if you do you can upcycle them to make these adorable garden markers! 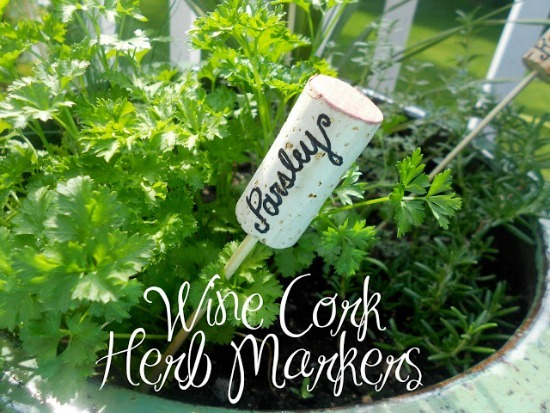 Shine Your Light explains how to quickly and easily make these DIY wine cork herb markers! 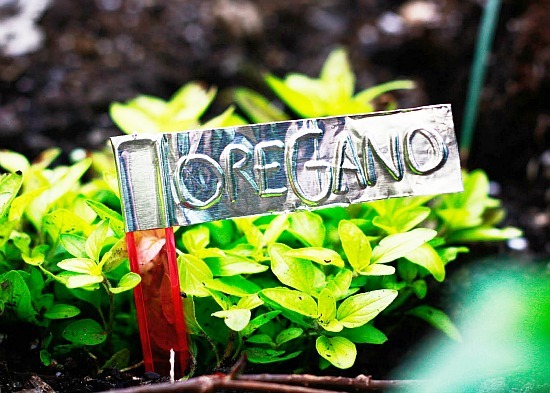 How about these plant markers made from aluminum duct tape (which you can get at a home improvement store or on Amazon)! Visit Aunt Peaches to find out how to make these aluminum tape plant markers. 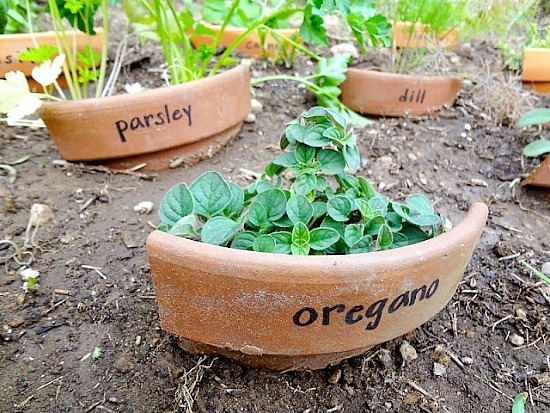 This is one of the best upcycling plant marker ideas I’ve come across! These broken pot DIY plant markers are from Hardly Housewives. Mmmm…. I’d have to purposely break some pots…. You can get the really teeny clay pots at Michael’s/Hobby Lobby or from Amazon. 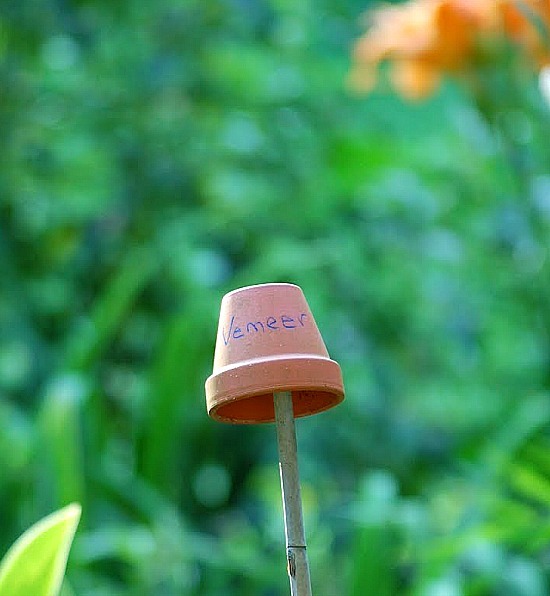 Head on over to Tidy Brown Wren to read about how she made her tiny clay pot plant markers. 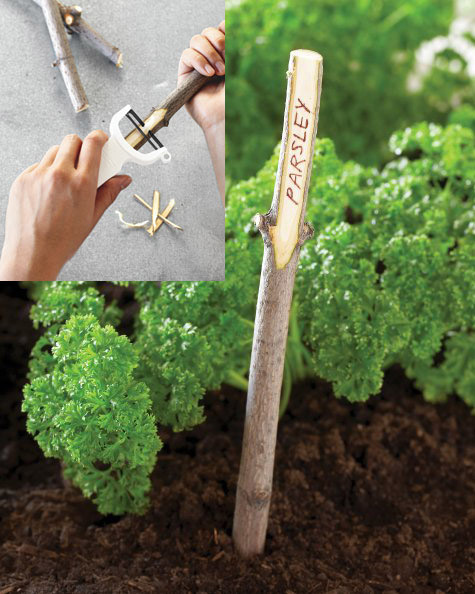 These twig plant markers would be super easy to do! Visit Martha Stewart for instructions on how to turn branches from your yard into DIY twig plant markers! I absolutely love the look of these rustic garden markers. 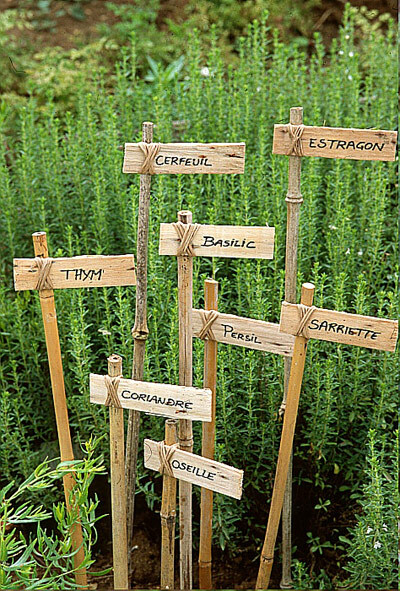 Visit Pith and Vigor for how to make these DIY rustic French plant markers! How do you label your plants? These are some really cute ideas! My grandson and I recently painted rocks to look like ladybugs, with wiggly eyes. I could see how it would be easy to make plant markers. All cute ideas. I use the rock method. I like the paint stick ones! Big enough to find when the plants are huge, but still cute because of the nice colors. There’s a link in my post to the free pattern download. Very cute. I like the twig ones best. Good thing, though, that my garden is so small I would only need markers to look adorable. Don’t use markers in my garden as there is just too much of it. I know what everything is and everyone else either has figured it out or asks about the very few confusing items. Parsley and Cilantro smell very different, so I don’t worry about those. Basil and Rosemary and known to all and I think the only two herbs that I pick myself are the Sage and the Oregano, probably because I use them way more than anyone else. I will admit though, that usually I just gather whatever herbs or veggies are being asked for as I enjoy it and it gives me a reason to eat peas from the vine and fresh tiny tomatoes for snacks. I remember you making the spoons! I love all the different ideas. I wish we had a house to do these fun things. We sold our house in April and now live in an apartment waiting for a house to be built for us. Waiting is not fun. Hello Manuela, you left such a nice comment on my blog that I had to come visit A Cultivated Nest. 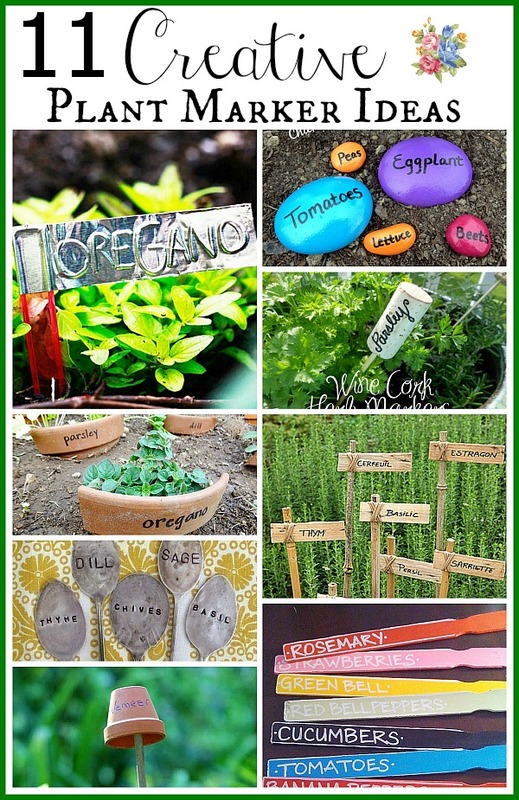 You have a beautiful blog and I have pinned several of the herb markers in this post. I always think I’ll remember what the herbs are but then get confused when it’s time to clip some. I clicked on your Simple Pleasures tab and I love the stories there, and the beautiful touches around your home. The green color of paint in what I think is your bedroom looks like what we recently did in my bathroom and dressing room. I love it and feel so serene looking at it. 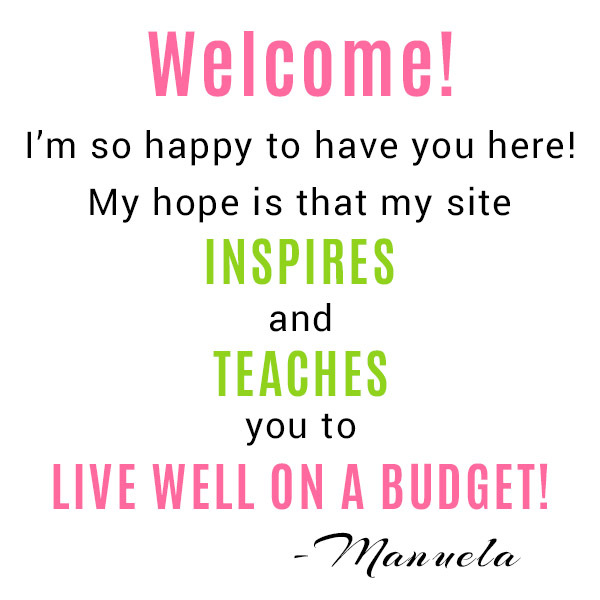 I’ll be back to explore more of your blog! 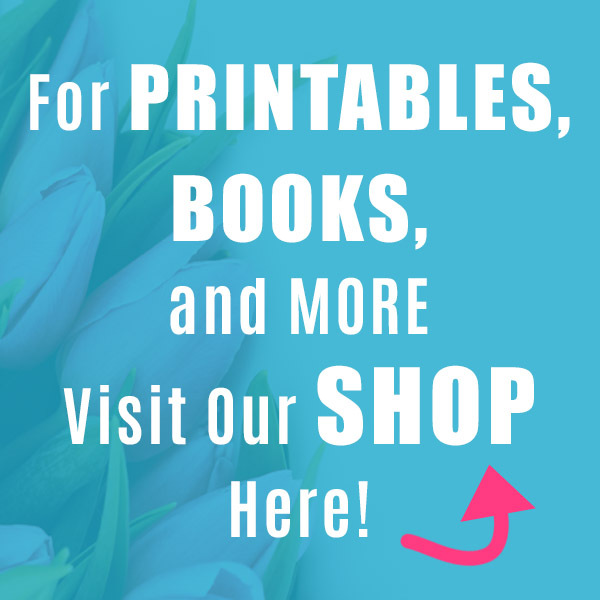 Lots of cute ideas – thanks for sharing them. I got some of the stamps from HF to use in jewelry creations, but never had much luck with them. I may not be hitting them hard enough. Love love the paint stick idea. I know I have a few in the junk drawer. I have used the cracked pot ones before. So fun to use up those old shards. Great post. Gotta pin it. I love those paint stick plant markers too. I decided that those are what I’m going to do for my veggie garden. I just love that you can paint them all different colors – although since their made of wood the probably would only last one season here (at least they’re cheap 🙂 ). 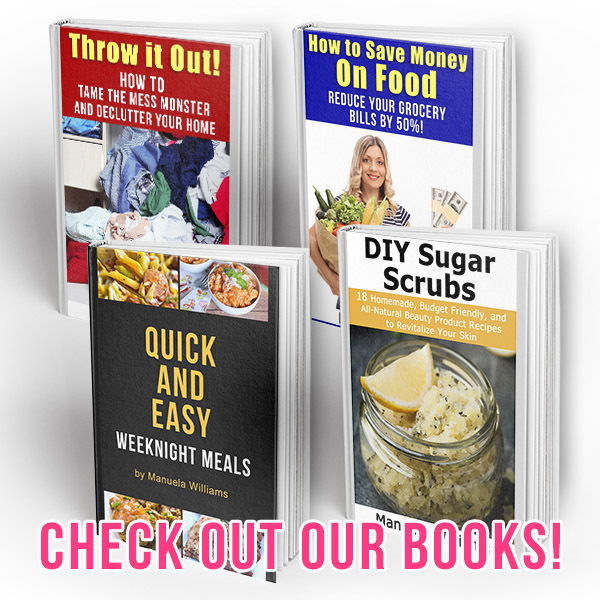 Oh my gosh, SO many cute ideas! Have a blessed evening, BIG HUGS! Dropping by from DIY Linky Party. When we had a garden, I would take the package the seeds came in and attach it to a stick and push it into the ground to mark the row. It would usually last the entire gardening season, though would be faded by the time fall rolled around. As we had a large garden, I would usually use the entire package of seeds, so had the empty package to use. I do really like those “hammered” and stamped spoons for plants makers. Thanks for all the ideas. That’s a great idea. I’ve seen where this was done and the put a glass jar over it. Which would be a good idea for wetter climates like mine.